I can't remember what day the heavy showers started, but it has been off and on throughout this past week -- along with occasional high winds. There have also been breaks of nice weather in between. Overnight lows in the lower 70s; daytime highs in the low 80s. We've been picking up an inch of rain here, another half inch there; the cistern is nice and full again and the fruit trees are loving it. TS Olga did pack some gusty wind, and actually took down the neighbor's tree. All the rain has prompted several stone walls to toss out a rock or two. We are having another round of whistling bands of rain and wind come through as I write. Because there have been breaks each day in between the rain, the whole thing is quite manageable, and people are starting to get into the holiday spirit with parties and other gatherings. The mail carriers are making several trips out to Coral Bay on some days, trying to deliver all the mail that comes with the holidays. Over the past three days or so (on the hillside outside of Coral Bay), we've received more than four inches of rain -- mostly deposited in heavy spurts. Winds have been up over 40 knots a few times during that period -- mainly during the overnight. Humidity is currently hanging around 90 percent, and the temp -- at 10 am -- is only 77 degrees. 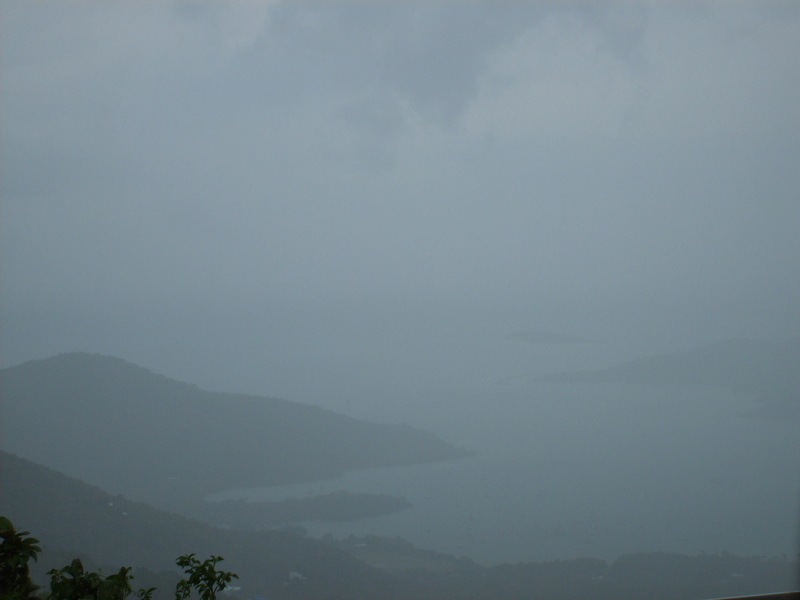 It is best described as gray, overcast and drizzly. The temperature went down to 73 degrees last night and, with the humidity, it feels chilly. Cistern is filling up -- getting closer to the top; haven't seen that in awhile. Just when we thought Dean had moved on -- occasionally puffing with gusts of about 35 knots this afternoon -- and dry as could be -- he turned on the tap. Just heard a large thunder clap to go along with it. We have been getting heavy bands of rain for the past few hours -- the tail end of Dean. We can certainly use the rain, but this is much more like a storm than a casual shower. 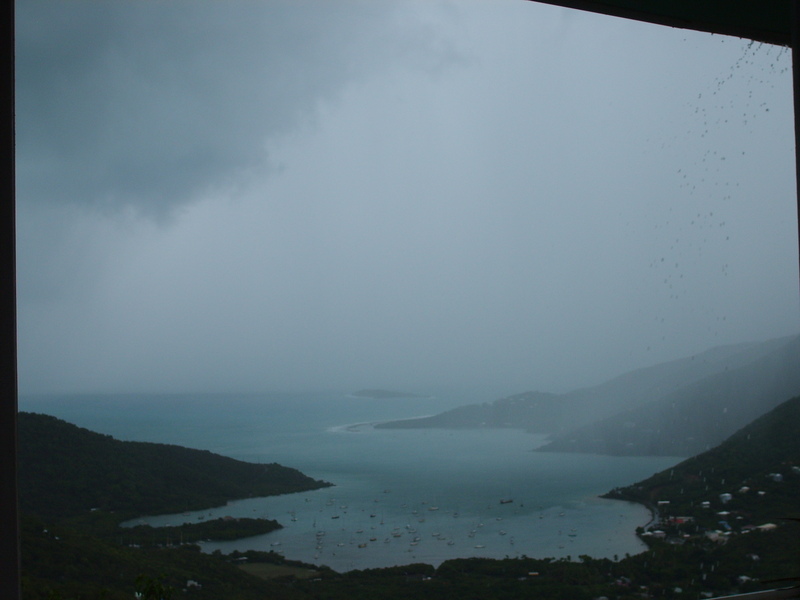 I'll try to send two pictures -- Coral Bay as the rain started; Coral Bay a few minutes ago. The US Virgin Islands continue under a tropical storm warning (that was not really expected by most people, given the southerly track of the storm). With coastal forecasts for gusts up to 55 knots, we thought it was a good idea to take the screens down off the porch -- just in case, and do storm-related prep work while we can. We've secured lightweight plants, tables, etc. Don't know how seriously others are taking this but, we figure we'll just have to do it at some point this storm season, so what the heck! It is very hazy and pretty warm -- 89 F; 65% humidity. We did get a decent wind gust earlier, and we are starting to get a bit of a breeze, but nothing that would indicate a storm. The wind must be mixing it up a bit, direction-wise; boats in Coral Bay are facing in several directions. Hard to tell what will reach us here. I do pray the islands that got the first visit from Dean have faired okay. The system (with potential) off the coast of Africa has our attention. Still too early to tell what, if anything, will come our way. However, we decided to locate our shutter boards (sticks/bars used to keep the shutters closed and secure) -- just in case we do need them late this week or at any other point this season. Several boards had become part of some other building project over the past year, so out came the saw to cut some new ones down to size. All and all, the weather has actually been pretty nice; partly cloudy with some breeze, but definitely a bit warmer and a little more humid than several weeks ago. Going for a swim still seems to cure everything! Nights are still relatively cool. Overnight as I write is 75.6 F (about 24 C). Daytime highs in the upper 80s F (31 C). Weather here continues to be pleasant for this time of year; not too hot, a little overcast, and an occasional shower passing by. All and all, nice summer weather in paradise. We got a dry run for hurricane season yesterday. An explosion and fire at a power plant in St. Thomas left that island and St. John without power for many hours. Evening came in full darkness, and the power didn't come back on until the middle of the night for most people. On the bright side, it really gave folks a chance to figure out what things they were missing for hurricane prep. I realized its a good thing to keep battery operated things (like cell phones, AM/FM radios and amateur radio transceivers) fully charged, because you just never know! !